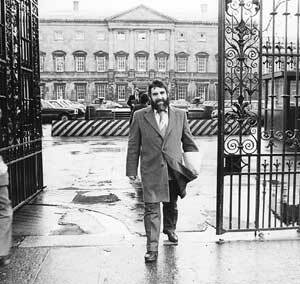 Sinn Féin TDs in Leinster House raised the case of Donegal Sinn Féin County Councillor Eddie Fullerton in the Dáil last Tuesday, with a series of questions to Justice Minister Michael McDowell. Fullerton was shot dead by a loyalist death squad in his Buncrana home in 1991. Critical questions still surround the circumstances of his death, particularly concerning British collusion. Eddie's case was recently brought to prominence when a TG4 documentary, Fullerton, highlighted the Garda handling of the original investigation. On Tuesday, Sinn Féin's Caoimhghin Ó Caoláin asked McDowell if the British Government had been confronted about its lack of co-operation with the recent Garda reinvestigation of the case and Arthur Morgan asked if the British authorities had been informed about the lack of cooperation from the PSNI. Martin Ferris inquired as to whether the Minister believed the murder of an Irish elected representative demanded a full public inquiry, while Seán Crowe raised the TG4 documentary and asked for McDowell's opinion on the Garda investigation, including its failure to question suspects and a key witness. Justice spokesperson Aengus Ó Snodaigh asked if the Garda re-examination report, which should have been completed in 2004, had been received by the Minister, and when he intended to publish it. McDowell told the Sinn Féin TDs that the Garda review was only now drawing to a conclusion because it was still awaiting results of a mutual assistance request to the British authorities and the PSNI. "I am recently in receipt of a report from the Garda authorities on the current, incomplete status of the review," McDowell said. "However, no final conclusions can be drawn until such time as replies from the British and Northern Ireland authorities are received, evaluated and acted upon, as appropriate, by the Garda Síochána." McDowell said he did not intend to publish the interim report, but that he had agreed to contact the Fullerton family's solicitors with a full response to their concerns and information on any further action he deemed necessary. Speaking on Wednesday, Aengus Ó Snodaigh said he welcomed the Minister's reply, particularly because it made clear that the British Government and the PSNI are holding up the process. But he said clarification was still needed on a number of issues. "The Minister says he will not publish the interim report he has received on the case, however, he avoids committing to publishing the final report, and we need this commitment from him," he said. He was also disturbed that the Minister had failed to answer whether he had raised the lack of cooperation with the British Government and said that if he hasn't, Sinn Féin wants a clear commitment that he will. "McDowell has been quick to point out that Sinn Féin cannot 'clamour for justice and truth' in other cases and not support the Breen and Buchanan inquiry, and he was correct," the Sinn Féin TD added. "Sinn Féin supports a fully inclusive process of truth recovery and we have supported the inquiry in the Breen and Buchanan case. We now say the exact same thing to Mr McDowell."